LCT Support Services is very pleased to be selected as the official Portsmouth port agent for LD Lines. This is the first major port agent contract won and establishes LCT Support Services as a significant player in port agency work in the UK and Europe. LCT Portsmouth will provide passenger and freight check-in, unaccompanied trailer control, marshalling and other associated port agent services to LD Lines. LD Lines is the Ro-Ro / Ro-Pax company within the Louis Dreyfus group, a major player in maritime transport since 1904 and proud to operate a fleet of over 60 ships worldwide. The group is active in shipping and providing "tailor made" industrial solutions. Portsmouth Ferry Port is the UK's premier port for the western channel. 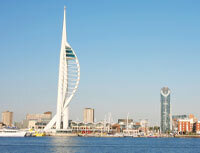 Portsmouth is Britain's most successful municipal port. The owners, Portsmouth City Council, have funded significant investment in the Port's infrastructure since 1976, while the Port's annual surplus is used mainly to reduce council tax in the city. For more information please visit LD Lines and Portsmouth Port.